Cherries, and the anthocyanins they contain, may play an important role in maintaining a healthy uric acid balance. Read on to learn more about this natural solution to gout. Round, red, and delicious, tart cherries are stars of the summer season. But did you know they also provide powerful nutrients for fighting pain and inflammation associated with gout? It usually starts something like this: It’s the middle of the night, and you’re woken from a sound sleep by a throbbing pain in your big toe. You feel like someone has your toe in a vice grip. It’s red and swollen and even feels warm to the touch. The pain is intense for a day or two and then slowly subsides after a week or more. You’ve got gout. 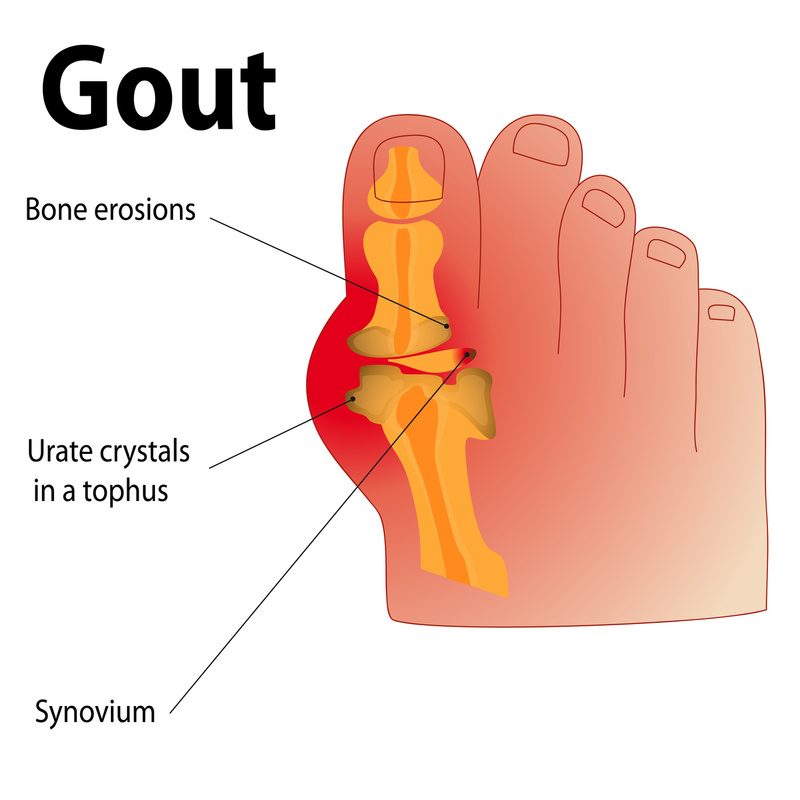 Gout is caused by a buildup of uric acid in the blood. The uric acid crystallizes in the joint— often the big toe—and causes severe pain and inflammation. These are not mild aches and discomfort. Many who suffer from gout tell me that the pain is excruciating, making it hard to walk or even dress themselves. Some have resorted to sleeping with a box around their foot because they can’t stand to have even a bed sheet touch their toe. Uric acid is a chemical your body creates when it breaks down purines, a substance found naturally in the body and concentrated in some foods, like red meat, beans, and alcohol. When your body can’t rid itself of uric acid, it builds up and forms sharp crystal deposits. These deposits often accumulate in joints, including the joint of the big toe, ankles, heels, wrists, and fingers. That’s gout. They call it “The Rich Man’s Disease” because, historically, only wealthy people could afford to eat the rich foods associated with gout attacks. But today, we are blessed—and cursed—with an overabundance of dietary choices that contribute to the increasing number of people who suffer from gout. Sadly, once you’ve had one gout attack, it’s likely you’ll have more, and people with chronic gout may have attacks, sometimes called flares, as often as every month. There is no cure for gout, and standard medical treatment, like heavy-duty NSAIDs (such as Celebrex), corticosteroids, or uric acid-lowering drugs, can cause significant side effects. There has to be a better way to combat gout. And, of course, there is. It’s cherries. Every summer people in my home state of Wisconsin flock to Door County, where the local cherry crop means roadside stands sell all things cherry—even cherry beer and wine. Many people make it a tradition to go to a “pick-your-own” orchard. What many people don’t know is that this little red fruit is an antioxidant powerhouse that researchers are investigating for their ability to prevent or treat injuries and diseases. Cherries contain anthocyanins-flavonoids that give cherries their deep red color. Studies show that anthocyanins reduce DNA-damaging inflammatory markers and oxidative stress and promote the production of healthy cells. Scientific studies of tart cherry suggest that it may be beneficial for a wide variety of health concerns, including relieving gout symptoms, improving muscle recovery following exercise, improving sleep quality, stopping chronic inflammation, and reducing the risks of type 2 diabetes—just to name a few. In all these studies, side effects were minimal or non-existent. This makes cherries a great alternative to pharmaceutical treatments with pages of serious warnings attached to them. We’ve known about using cherries to treat gout for a long time. Finally, the science is starting to catch up, and recent studies indicate that tart cherry is highly effective as a treatment for gout. The first clinical study I found on tart cherries that mentioned uric acid was a 2009 study that examined cherry juice in marathon runners. In this study, runners were given cherry juice or placebo daily for five days before a marathon, the day of, and 48 hours after the marathon. The researchers measured muscle damage, inflammatory markers (including uric acid levels), and oxidative stress before and after the race. They reported faster strength recovery and reduced inflammatory markers in the cherry group. Of particular note to those who suffer from gout, uric acid levels stayed virtually the same in the cherry group, but increased post-race in the placebo group. A 2012 article published in Arthritis summarized three studies that investigated the use of tart cherries as a gout treatment. The in vitrostudy found tart cherry juice concentrate was able to inhibit inflammatory markers in cells, demonstrating tart cherry’s potent anti-inflammatory effects. The researchers theorized that it may be these anti-inflammatory effects that make tart cherry work so well for gout. Tart Cherry and Black Cherry Extracts – It Works! Another article also presented the findings of a retrospective study of 24 patients that took cherry juice concentrate for at least four months. In this study, the researchers compared those taking an uric acid lowering medication from those who didn’t. The 11 people in the study who didn’t use the prescription drug were not randomized—they were people who had contraindications, intolerance to the drug, or were not getting any results from the drug treatment. The cherry juice concentrate reduced gout flares in both groups from nearly seven per year to about two per year. Fifty percent of all patients were flare-free at four to six months. It is especially important to note that the people who did not benefit from the uric acid reducing drug still benefited greatly from the use of cherry juice. A 2014 clinical study examined the effects of tart cherry juice on plasma levels of uric acid and inflammatory markers in healthy volunteers. The researchers found that those who drank 30 or 60 ml of cherry juice for two days had reduced levels of uric acid and C-reactive protein, an inflammatory marker, in their blood, regardless of the tart cherry dose. 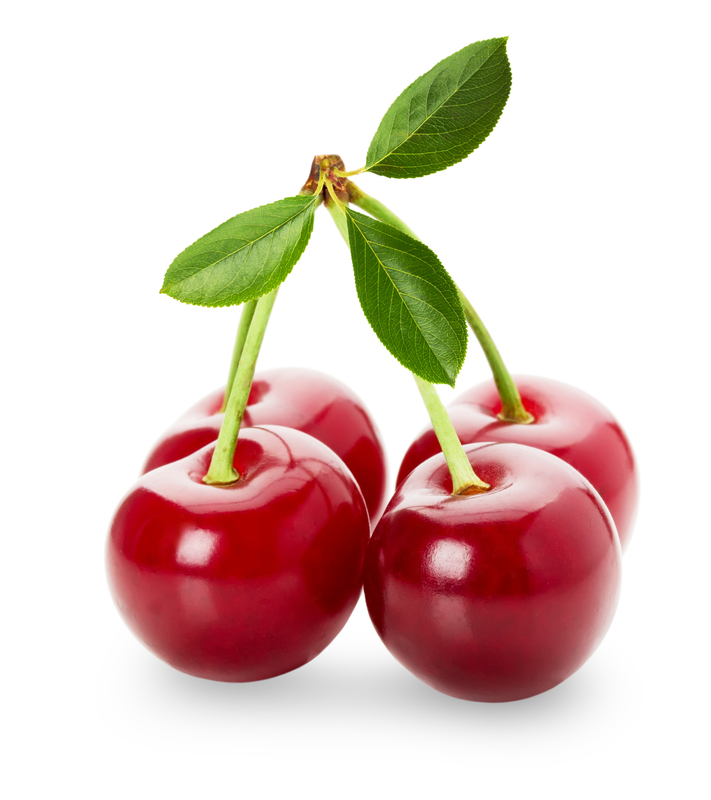 Uric acid output in urine samples was increased, suggesting that tart cherry helps the body process excess uric acid. This is very important in gout because excessive uric acid buildup triggers the excruciating pain and deformities. You may have noticed that a lot of the research on cherries involves cherry juice or cherry juice concentrate. So why shouldn’t you just drink juice? The problem is sugar. Tart cherries are quite sour, and tart cherry juice contains a lot of added sugar to make it palatable. In fact, a cherry juice concentrate used in one of the clinical studies includes 80 calories and 15 grams of sugar in a one-ounce serving. That’s a lot of sugar in two tablespoons of concentrate. We know that dietary sugar causes inflammation, which is already a problem with gout, so why would you want to add to your sugar load? That’s why I recommend adding tart cherry to your regimen in the form of a supplement. Taking a capsule or two is so much more convenient, and a quality capsule will not have added sugar. Drying is an ancient process used to preserve food. Unfortunately, the nutritional content in foods can be drastically altered or reduced when dried conventionally. This is why freeze-dried cherry fruit is superior. The absence of water combined with the low process temperature stops cellular deterioration, enzymatic activity, and microbiological reactions. Freeze-drying retains the ideal phytochemical content, enzymatic activity, nutritional value, and bioactivity of fresh cherries. Unfortunately, freeze-drying is expensive, but this is definitely an example of getting what you pay for. That’s why I recommend supplements that use freeze-dried cherries instead of cherries that have been dried by conventional hot air-drying, spray-drying, or sun-drying. 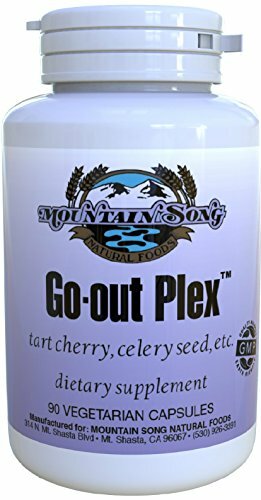 Tart cherry is the natural choice to stop the pain and inflammation of gout and reduce the number of gout attacks. It also keeps your joints flexible, your blood sugar levels stable, and your arteries healthy. I strongly encourage you to make changes to your daily food choices, drink 8 glasses of water a day, and add a quality freeze-dried tart cherry supplement to your daily regimen. You’ll notice a dramatic difference! To help stop the pain and inflammation of gout and reduce the number of gout attacks, I recommend taking 750-1,500 mg of tart cherry (Prunus cerasus) twice daily. Terry Lemerond has 45 years of experience in the health food industry as an owner of several health food stores and dietary supplement manufacturing companies. He has researched and developed over 400 nutritional and botanical formulations that continue to be top selling products on the market today. Grants Health Copyright © 2018.